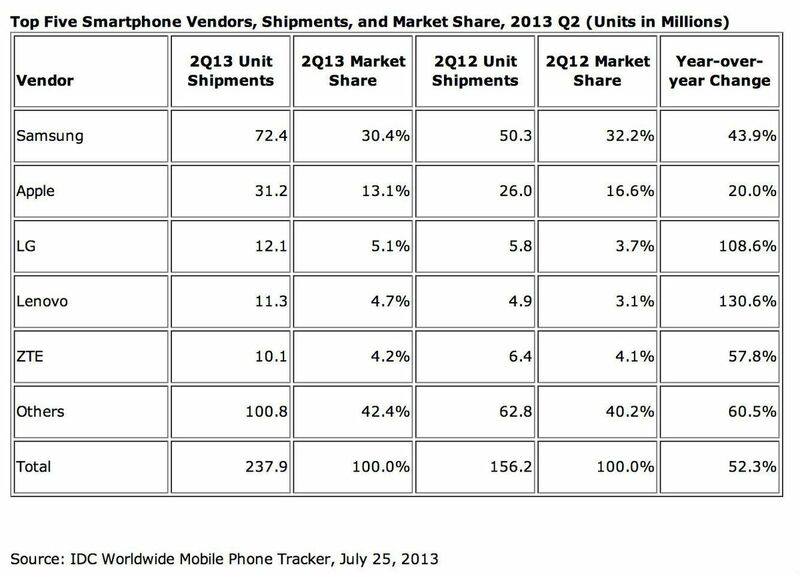 The IDC (International Data Corporation) has come out with a new chart that ranks the top five smartphone vendors based on shipments and market share over Q2 in 2013 and 2012. If you take a look at the chart below, you will see a huge contrast between Samsung and all of the other vendors... Apple included. We often report on the Samsung versus Apple race and as of the past year, Samsung has held the reigns and taken the lead for smartphone market share and shipments. In Q2 alone, Samsung shipped over 72 million units, up 22 million units from last year, giving them over 30% of the smartphone market share. Apple falls in second but as you can see, they have the lowest year-over-year change, which I believe proves that Apple fans (like myself) are very loyal to their brand and devices. Although Samsung and Apple hold the lead, it's interesting that their market share has dropped by a few percent while all others (LG, Lenovo, ZTE and more) have increased. Where do you fall in the 237.9 million units of smartphones sold in Q2? Did you switch up your device or stay loyal to what you own? Let us know in the comments below!